FILE - Former United Nations Ambassador John Bolton speaks at the Southern Republican Leadership Conference in Oklahoma City, May 22, 2015. U.S. Defense Secretary Jim Mattis said Tuesday he had no reservations or concerns about President Donald Trump's incoming national security adviser, John Bolton, a hawk who has advocated using military force against North Korea and Iran. "We're going to sit down together [this week], and I look forward to working with him. No reservations. 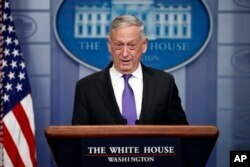 No concerns at all," Mattis told a group of reporters at an impromptu briefing. "Last time I checked, he's an American and I can work with an American. OK? I'm not the least bit concerned with that sort of thing." Mattis had forged a close relationship with both McMaster and Tillerson as he successfully advocated to keep U.S. troops in Afghanistan and strengthen ties with NATO, despite Trump's skepticism about both the 16-year-old war and the trans-Atlantic alliance supporting it. 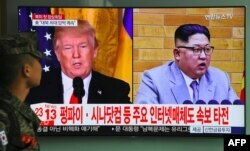 FILE - A South Korean soldier walks past a television screen showing pictures of U.S. President Donald Trump, left, and North Korean leader Kim Jong Un at a railway station in Seoul, March 9, 2018. "Right now, every word is going to be nuanced and parsed apart across different cultures, at different times of the day, in different contexts," Mattis said at the time. In 2003, on the eve of six-nation talks over Pyongyang's nuclear program, he lambasted then-North Korean leader Kim Jong Il in a speech in Seoul, calling him a "tyrannical dictator." North Korea responded by calling Bolton "human scum." More recently, Bolton described Trump's plan to meet North Korean leader Kim Jong Un as "diplomatic shock and awe" and said it would be an opportunity to deliver a threat of military action. Barry Pavel, a U.S. national security expert at the Atlantic Council think-tank, said it was too soon to predict Bolton's style or draw conclusions about how he would run the National Security Council. "When you're in a position like he's going into, it's a very, very solemn set of responsibilities ... and those have a restraining factor," Pavel said. Asked by Reuters about the split between his world views and Bolton's, Mattis sought to dismiss concerns, suggesting lively debate would help ensure Trump has a wide array of options. "Well, I hope that there's some different world views. That's the normal thing you want unless you want groupthink," Mattis said. "You know, don't worry about that. We'll be fine."